Even though I cycled over 300 km last week, the Thanksgiving feasts of turkey, cookies, cake, pie, and chocolates ended up winning on the scale this morning. I never restrict my calories, nor when or how much I eat, so I have to stick to the low-fat whole foods to lose weight. I think I would have done fine with all the eating out, and the higher fat “real” foods, but it was all the desserts that did the damage. Maybe for Christmas, I’ll eat the roast beef, but none of the desserts. I’m back on the high-carb, low-fat eating plan, and I’ll probably see improvements on the scale over the next few days. 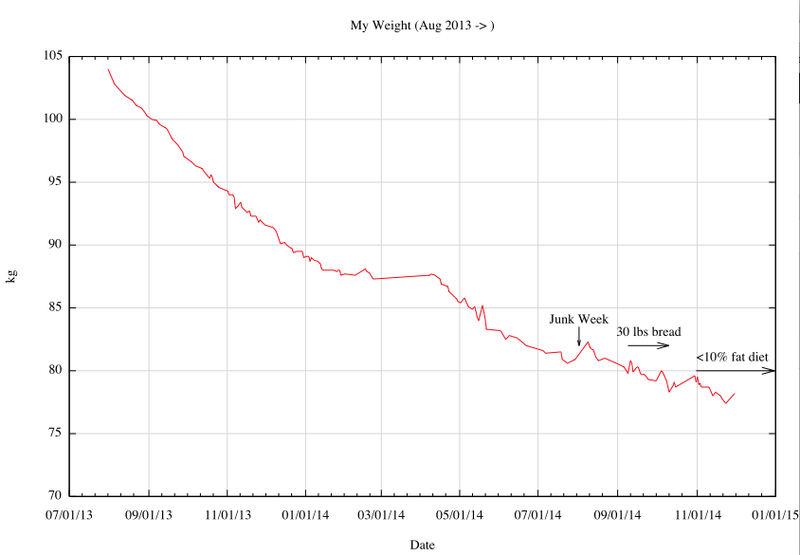 I’m pretty familiar with how my body weight reacts on my diet, so I know it’ll continue back down. I was afraid of stepping on the scale this morning, but overall, the slight uptick is no big deal. It could have been a lot worse, and I again learned the lesson that “you can’t outrun your fork”.